New Years Resolutions 2013! - The Resourceful Room! 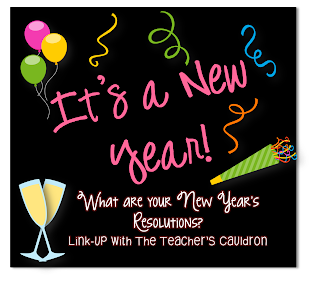 I am linking up with Jen over at The Teacher's Cauldron to share my New Year's resolutions! My personal resolution is to spend more meaningful time with my family and not spread myself so thin that I am doing lots of things ok and start doing a few things really well! I always want to help but I find myself stressed and frazzled when it's time to settle down with my family I'm to tuckered out to really enjoy them. With my children turning 16 and 15 this summer I know there won't be many more years when we are all together the way we still are now!! My blogging resolution is to let got of statistics and stop trying to make sure I accommodate every opinion I read and just enjoy blogging about what is going on in my classroom. I sometimes stress over lower page views one month or times when I am down a follower. I still haven't posted anything for sale on TPT because I want people to come visit my blog and I sometimes think no one will If I'm not posting fabulous freebies all the time! I love blogging and the friendships it has brought about for me, I just want to keep it enjoyable and not stress so much about what others might think!! It's a journal and I love it!! I'm working on a printable to match it that I can post in my home to keep me on track!! I am looking forward to the New Year and a new start!! I wish you all the best in 2013!!! Can't wait to see all the good it brings to all of you! I love the gift from your brother. I need that reminder posted everywhere!! Here's to a great 2013! Awww, it sounds like you are going to find some serious balance in 2013...will you help me out with that once you have it all figured out?!? You are so right!!!! I have a senior & a freshmen going in two different directions. I so miss the days when we sat at the table doing homework together when they were in elementary school. Soak it all in!!!! I love your one little word prayer. Prayer is so powerful I think we forget about it sometimes. Love the present your brother gave you. If you get a printable made with it on there you should definitely offer as a freebie. I have a special prayer request on my blog I would love for you to check it out.